Bluebonnet Images - Bluebonnets Sunset at Lake- A field of Texas bluebonnets taken at sunset as the cloud backlight with these pink colors across the sky. The sky reflected the colors into the water below as the sun set in the west. These bluebonnet wildflowers were wonderful this year they created a blanket of blue flowers over this field for a beautiful Texas landscape. 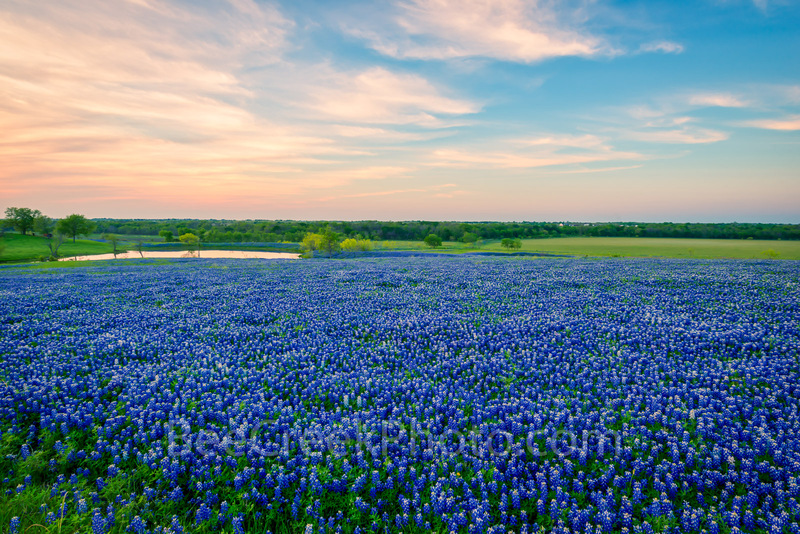 These texas bluebonnet image were near Ennis also a great year for wildflowers in the lone star state, I think we capture the best texas landscape this year here. . Photo © copyright by Bee Creek Photography - Tod Grubbs / Cynthia Hestand.